Less than a week after appearing on the PS4, Sky's Now TV streaming app has arrived on Xbox One. 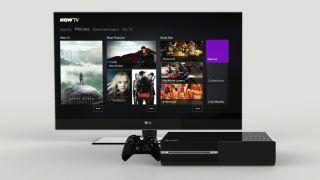 The new app nicely adopts Xbox One's tiled interface, but don't worry if it all seems a bit unfamiliar: you'll have full access to all of Now TV's movies, sports and entertainment as per usual. And since Microsoft has now ditched its subscription requirement to access Live apps, you'll only need to pay the regular Now TV costs - no more 'double dipping'. "Sky is an important partner for Xbox," said UK Xbox Live Product Manager Pawan Bhardwaj. "And with the launch of NOW TV on Xbox One, our hands have even more ways to enjoy their favourite TV shows live sport and a movies." A PS4 system update this week introduced support for 3D Blu-ray playback, with Xbox One set to get the same functionality some time in August. Now TV joins a selection of Xbox One services including Netflix, Amazon Instant Video and 4oD as it gradually morphs into the multimedia machine we were promised, but still (still) we wait for BBC iPlayer.